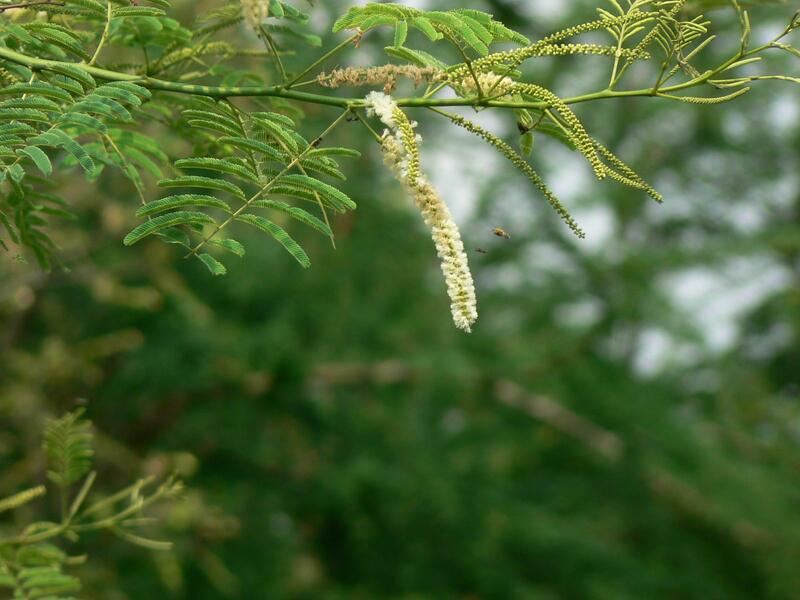 Acacia catechu (L.) Willd., Oliv., Acacia catechu (L. f.) Willd. var. catechuoides (Roxb.) Prain, Acacia catechuoides (Roxb.) Benth., Acacia sundra (Roxb.) Bedd., Acacia wallichiana DC., Mimosa catechu L. f., Mimosa catechuoides Roxb. Black cutch (Senegalia catechu P.J.H. Hurter & Mabb., formerly known as Acacia catechu (L.) Willd., Oliv.) is a moderate-sized deciduous tree native from Asia which is valued for the production of tannin ("cutch") extracted from its heartwood. Its branches are extensively lopped for fodder before leaf fall (Orwa et al., 2009). Senegalia catechu is a small or medium-sized, thorny tree up to 15 m tall. Its taproot grows to 2 m deep (CRC Weed Management, 2003). Its bark is dark grey or greyish-brown, peeling off in long strips, or sometimes in narrow rectangular plates, brown or red inside. The branches are shiny, slender, puberulous when young but glabrescent after, the base of each petiole bearing 2 curved, 8-mm long prickles. The leaves are bipinnately compound, with 9-30 pairs of pinnae and a glandular rachis. Each pinnae has 16-50 pairs of oblong linear leaflets, 2-6 mm long, glabrous or pubescent. The inflorescence is a 5-10 cm long axillary spike of small pentamerous flowers, white to pale yellow in colour, with conspicuous stamens exserted from the corolla. The fruit is a beaked pod, 5-8.5 cm x 1-1.5 cm, flat, shiny, brown, dehiscent. It contains 3-10 flat, ovoid, dark brown seeds, 5-8 mm in diameter (CRC Weed Management, 2003). There are 15,000-40,000 seeds/kg (Subansenee, 1991). Senegalia catechu var. catechu, var. catechuoides and var. sundra occupy different areas in India. Var. catechu is found in the sub-Himalayan tract and the outer Himalayas, and ascends up to 900-1200 m elevation. Var. catechuoides is found in Sikkim terai, West Bengal and Assam (it is also the main variety in Burma). Var. sundra occurs in the Deccan, Maharashtra, Gujarat and Rajasthan. Senegalia catechu is a valuable fodder tree for goats and cattle, and its slender branches are lopped before main leaf fall. The seeds are a source of protein though they have unbalanced amino acid content and a high content of water soluble mucilage. The tree is a host for lac insects. Both fruit and stem are used in Myanmar to poison fish (Subansenee, 1991). Flowers are attractive to bees and provide an excellent source of nectar and pollen (Kumar et al., 2016). Black cutch is used as live fence (Subansenee, 1991). Senegalia catechu provides a highly calorific firewood that also makes good quality charcoal. Its high density wood is resistant to white ants and is used for posts, agricultural implements and wheels. Dark catechu called "pegu cutch" helps tanning heavy hides. Catechu extract is a preservative for nets and ropes and is used for dyeing textiles, paper and leather to a dark-brownish colour. The crystalline portion of a concentrated decoction of the wood, called 'katha' or 'kath', is mixed with betel (Piper betle) leaves to produce betel chewing paste (Subansenee, 1991). In France, it is an ingredient of the famous century-old confectionery "Cachou Lajaunie". Katha, khersal (a natural crystalline deposit sometimes found in cavities of the wood) and other parts of Senegalia catechu (bark, seeds) are reported to have uses in ethnomedicine, such as treatment cough and sore throat, wound healings, antidiarrhoea, antibacterial, etc. (Subansenee, 1991). Senegalia catechu is native to India, Myanmar, Nepal, Pakistan and Thailand, and is found in Afghanistan and in parts of Indonesia where it was introduced as an ornamental. It occurs naturally in mixed deciduous forests and savannas of lower mountains and hills in subtropical or tropical regions. In India, it is found from 1000 to 1500 m altitude, while in Australia it grows from sea level up to an altitude of 520 m (Ecocrop, 2017). Black cutch is a xerophilous species: it is common in the drier regions where few other tree species survive, but maximum growth is obtained in places with heavy rainfall (ICFRE, 2015). In dry areas, black cutch is found on sandy or alluvial soils of riverbanks and watersheds. Alluvial forms are also able to grow in places with high annual rainfall (3800 mm) (CRC Weed Management, 2003). Senegalia catechu is a hot climate species: it grows where the mean daily hottest temperature is from 37.5 to 43.5°C and the mean daily coldest temperature is 1-2.1°C (ICFRE, 2015). It does well on most soils though shallow to medium deep, well-drained sandy soils seem to suit it best. In its native range, black cutch shows some invasiveness in degraded areas such as overgrazed grasslands, and becomes an expensive and difficult to eradicate species (CRC Weed Management, 2003). 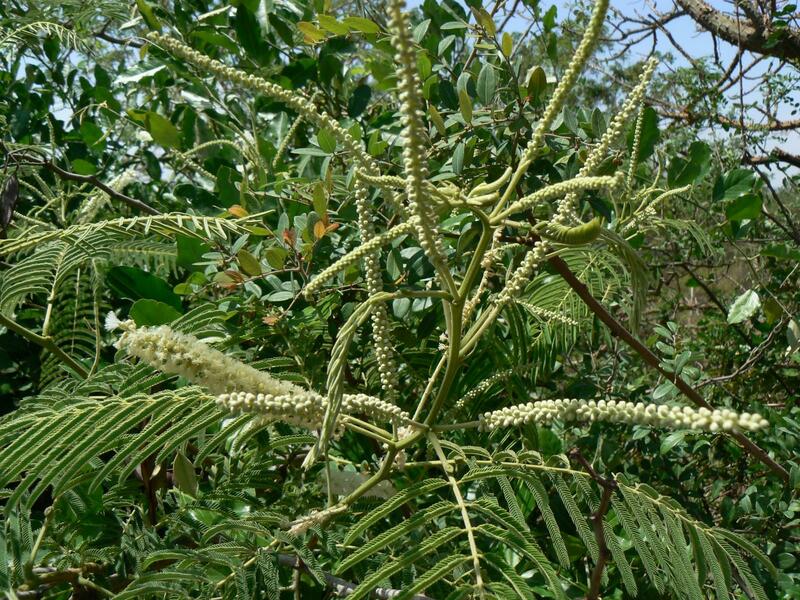 In its native range, Senegalia catechu is a relatively slow growing tree: no growth occurs during the dry season. It may require 55 years to reach a height of 10 m (CRC Weed Management, 2003; Subansenee, 1991). It can be propagated by direct sowing, coppice, by nursery-raised seedlings or by stump planting. It might be useful to put the seeds in boiling water and then leave them for 24 hours to cool before sowing. In India, sowing period is late spring-early summer, in a 0.5 cm deep seedbed. Line sowing is recommended to facilitate further weedings but broadcasting is possible (ICFRE, 2015). The seedbeds should be watered thoroughly. In flooded areas, the seeds should be sown on a raised bed of about 60 cm high (ICFRE, 2015). Nursery raised seedlings should be planted when they are 3-6 months old or 30-50 cm high. Recommended plant spacing is 4 m x 6 m or 2 m x 4 m. In wet regions the seeds may be sown directly in the field (Subansenee, 1991). In Uttar Pradesh, the "Taungya" technique consists in intercropping black cutch with field crops (ICFRE, 2015). During the establishment period, black cutch grows slowly and should be weeded, and protected from fire and from grazing animals. Growth is initially slow but increases as roots develop. It is advisable to carry out regular weeding programmes, especially in the rainy season. Flowering occurs during the rainy season, and seeds ripen and drop at the end of the rainy season or at the beginning of the dry one. Germination occurs after the first major storms of the following wet season (CRC Weed Management, 2003). In India, black cutch loses its leaves in January and February, with new leaves appearing in April-May and completely covering the tree by June-July. It mainly flowers in the wet season, but mature trees can flower year round. Seeds ripen and drop at the end of the wet season and throughout the early dry season (CRC Weed Management, 2003; Subansenee, 1991). Black cutch regrows readily after branch cutting (CRC Weed Management, 2003). 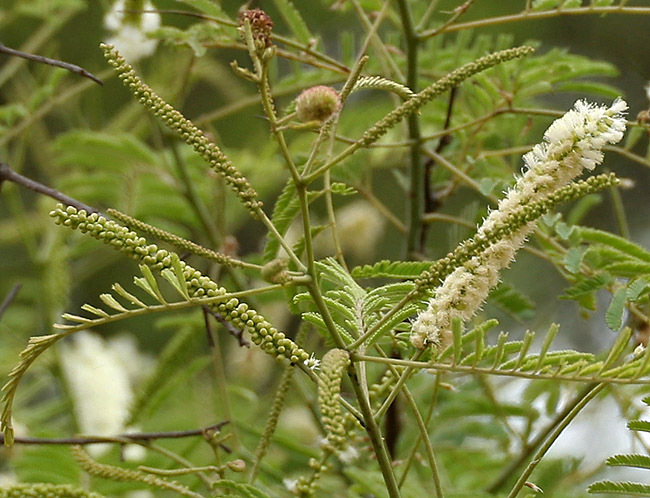 In Australia, Senegalia catechu is part of the Federal Government’s Alert List for Environmental Weeds (2001), which consists of 28 weed species that had limited distributions but could potentially cause significant damage. Black cutch is considered a weed in Australia, where people feared it could cause economic damage by forming dense impenetrable stands after it had escaped from the Darwin Botanic Gardens. It was considered a threat to primary production by displacing and/or shading pastures. The sharp thorns on the branches could impede the movement and mustering of stock. Though it is now under control in the escape region, its spread is forbidden anywhere in Australia (CRC Weed Management, 2003). Black cutch has a moderate protein content, ranging between 14 and 21% DM (Bhadauria et al., 2002; Mlay et al., 2006; Sahoo et al., 2010; Gupta et al., 2011; Verma et al., 2014) possibly depending on origin, age and leave/stem proportion. Black cutch leaves contain catechins which are flavonoid compounds with strong antioxidant activity (Shen et al., 2006). Catechins represent about 3.5% DM (Shen et al., 2006). Black cutch is often fed to livestock. 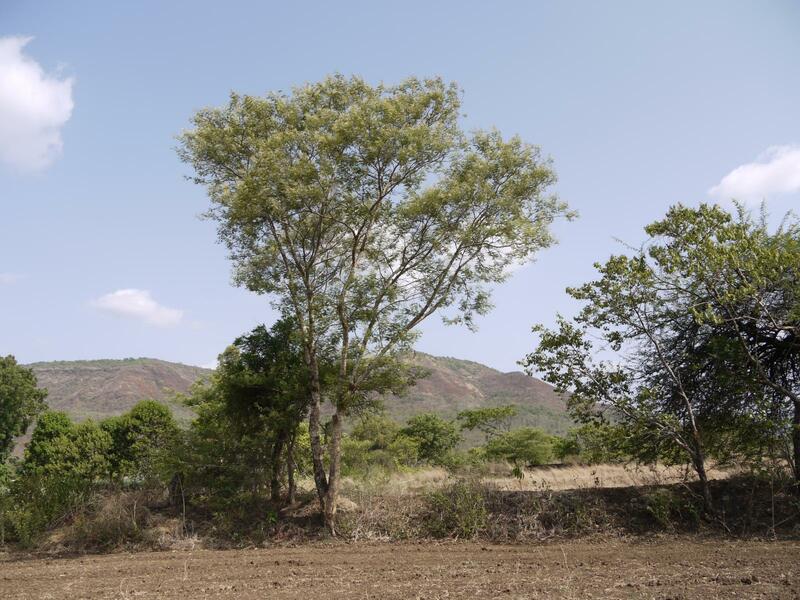 Branches were reported to be cut quite often for goat fodder and sometimes cattle fodder (Verma et al., 2014). In a participative study held in India, farmers reported that they commonly supplement their grazing goats and sheep with the leaves of local species such as black cutch (Maharaj Singh et al., 2002). There is limited information on the nutritional value of black cutch. An early study reported a OM digestibility value of 67% (Sen, 1938) while more recent in vitro estimates reported values ranging from 45% (gas method), 51% (pepsin) to 86% (enzymatic) (Singh et al., 2000; Mlay et al., 2006). Information about protein degradability is also conflicting: some studies report that the protein of black cutch leaves is mostly degradable (up to 60%) (Bhadauria et al., 2002; Gupta et al., 2011) while another study found an extremely low value for N effective degradability (14%) (Singh et al., 2000). No information seems available in the international literature on the use of Senegalia catechu in rabbit feeding (July 2017). However, the leaves are traditionally used in India as fodder for sheep and goats (Singh et al., 2006) and could therefore probably be used to feed rabbits, though feeding trials should be required. It will be also be necessary to assess the protein value of this forage by rabbits since the N degradability for ruminants was found to be extremely variable (Mlay et al., 2006; Singh et al., 2000).